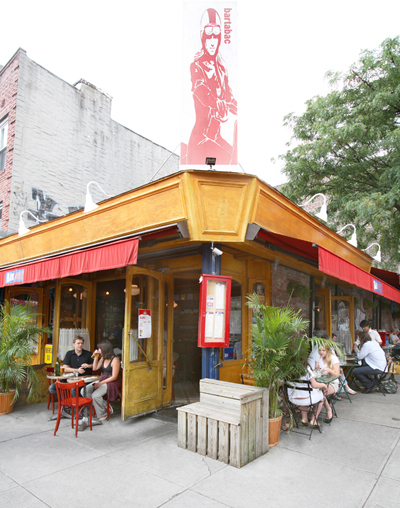 Bar Tabac imparts vibrant energy to the Cobble Hill neighborhood in Brooklyn and compliments Smith Street’s bohemian spirit. The colorful corner storefront embodies the spirit of the tabacs in France, the ubiquitous small storefronts and annexes in bars that sell lottery tickets, chewing gum, and of course, tobacco. Bar Tabac may not actually sell tobacco, but the lively camaraderie and antique 1960’s bar conspire to compose a unique place that is authentically French but delightfully local. Live jazz four times a week, storied weekend brunches and irresistible Bistro Bites have led to Bar Tabac’s loyal following. Guests return again and again to enjoy themselves in the lively bar, or to spend an intimate evening in the back room amidst the glow of candles illuminated under the atrium skylight.